NEW PRODUCT – 5.0″ 40-pin 800×480 TFT Display without Touchscreen « Adafruit Industries – Makers, hackers, artists, designers and engineers! NEW PRODUCT – 5.0″ 40-pin 800×480 TFT Display without Touchscreen. 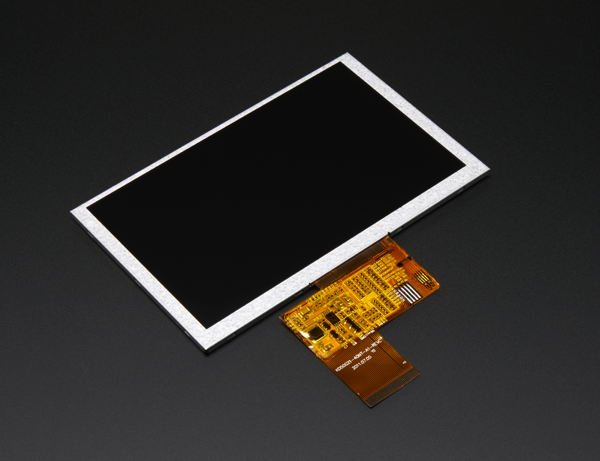 This 5.0″ TFT screen has lots of pixels, 800×480 to be exact, and an LED backlight. Its great for when you need a lot of space for graphics. These screens are commonly seen in consumer electronics, such as miniature TV’s, GPS’s, handheld games car displays, etc. A 40-pin connector has 8 red, 8 green, and 8 blue parallel pins, for 24 bit color capability. This version does not have touchscreen attached. It’s exactly the same TFT display as PID 1596 but without the resistive touch panel so it is a little less expensive.